This project is a clone of PICkit-2, (the most successful and cheapest PIC programmer on the market). But PICkit-2 is being phased out and will not be available in the near future. The replacement is more expensive and has less features! PICkit-2 is fully assembled and does not satisfy those who want to construct their own programmer. All the other components are standard items, except the 1mH choke. This is supplied as a 10mH choke and you need to remove exactly 340 turns of the winding to create a 1mH inductor. Our kit has two additional features, It comes with a 6 pin to 5 pin adapter to connect PIC-2 USB Burner to the project you are designing and an 8 pin to 18 pin adapter, so you can burn 18 pin chips. You can also get a "burner board" containing an 8 pin socket (for the chip you will be programming). See below for all these extras. 1. PIC-2 USB Burner and CD titled: "PIC-2 USB Burner software"
Lift Counter Uses a PIC12F629 with LED display and up/down buttons. Sky Writer Uses a PIC12F629 to put messages "in the air." The circuit consists of a high-voltage section plus components to connect the PIC18F2550 chip to the 8-pin programming socket on the "Burner Board." 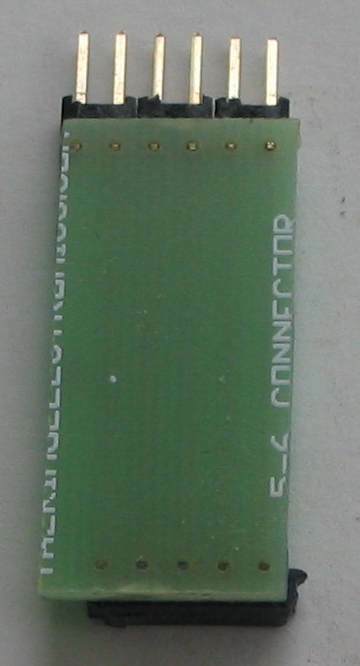 The PIC18F2550 is a specially-designed chip that interfaces to the USB port and handles data from your computer to the chip your are burning, as well as data from the chip on the "Burner Board" to the computer. This saves the need for any other chips in the burner project. The 20MHz crystal must be 20MHz as the chip must handshake, at the correct speed, with the program on the computer. The only other requirement is to generate approx 13.5v to open up a chip, so it can be read and programmed. Some chips require slightly less than 13v but some need nearly 14v. 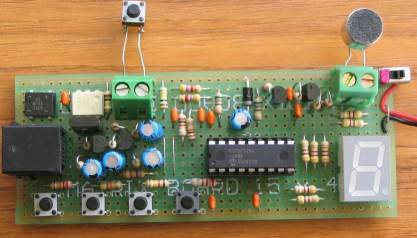 This voltage is passed to the chip being programmed by the first three transistors. The remaining resistors are safety resistors to prevent the PIC18F2550 being damaged if a short is present on any of the lines on the "Burner Board." The heart of the circuit is a PIC chip. This chip is pre-programmed in the kit because you need a programmer to program it! It's a "Catch-22" situation or a "Chicken-and-the-egg. You need a programmer to program the chip so you can program chips. This means you cannot build this project yourself from components you have "on-hand" as you will also need a programmer to load the operating program into the PIC chip. The kit is not expensive and comes with a neat PC board. So it's best to get a kit. You can also purchase the 6 pin to 5 pin adapter and a board to hold an 8 pin IC socket as well as an 8 pin to 18 pin adapter. This gives you all the tools needed to program 8 pin and 18 pin PIC chips. If you have one of our other programmers, you can burn a PIC18F2550 and build this project. If your USB lead does not have the same colours as shown on the circuit above, use the USB plug shown above to work out the colours. Use a multimeter set to low ohms range and find the +5v wire, the Data- wire, the Data+ wire and the Ground wire. Any copper wire wrapped around the leads is a shield and is not connected to any of our circuitry. The project has 3 LEDs. The green and red LEDs connect to the incoming Data+ and Data- lines of the USB port and show when signals are present on these lines. These LEDs show activity and do not have any special importance. They show when PICkit 2 Programmer software is installed and when your laptop recognises the PIC-2 USB Burner. The yellow LED has three features. It is the high-speed rectifying diode in the voltage-pump section and allows the positive portions of the high-voltage pulses from the 1mH inductor to pass to the "accumulator section" where a 22u stores the high voltage. Two resistors in a voltage-divider network tap this voltage and send it to a pin on the chip, where the chip controls the pulses sent to the oscillator transistor. When this voltage is 3.6v the voltage at the top of the divider is about 13v. In idle mode, the yellow LED detects 5v and it illuminates at a very low level. When the programmer is activated, it "opens-up" the chip you are programming by supplying 13v to the programming pin and reads the type-number of the chip. The yellow LED will flash very brightly when doing this. The yellow LED also indicates at high brightness when the programmer is burning a chip. The kit is complete with all components, a pre-programmed PIC18F2550 chip and USB lead. All the components fit on the PC board and the IC fits into the 28 pin IC socket. You may have to file the edges of the 6 pin socket to make it look neat. The 1mH choke is made from the 10mH choke provided. Carefully unwind the winding and leave the last few turns on the core. Now start winding 160 turns then twist the wire twice around the unused pin. With a hot soldering iron, heat up the wire and pin with a small amount of solder and this will remove the insulation and connect the wire. The USB lead is cut to 30cm so the burner can be used close to your laptop without cluttering the desk with a long lead. The 4 coloured wires inside the cable must be fitted into the correct holes. Fit the chip after all the components are soldered in place and the project is ready for testing. You will need the 6 pin to 5 pin connector. Make sure you look at the photo before soldering the pins as they are soldered to the track-side of the board. 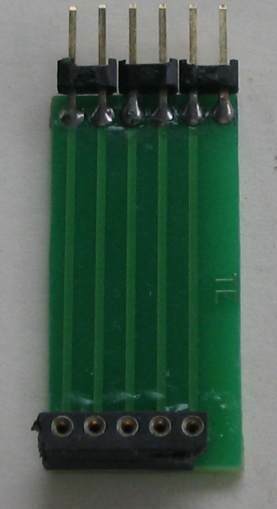 If you solder the pins to the wrong side of the board, the connector will operate in reverse and damage the burner. Finally you need a board and socket to hold the chip you are going to "Burn." (program). The following photo shows this board with 5 pins and wire to the 8-pin socket. You are now ready to "burn" a chip. You need to select a kit from the list below. All kits come with a pre-programmed chip, but with the "Burner" you are able to modify the program and create different or additional effects. The CD that comes with PIC-2 USB Burner contains all the software needed to set up the burner and program a wide variety of chips. All the latest chips are recognised by the burner and will program automatically. Both prototypes worked immediately so the circuit is very reliable. Any faults will be due to wrong components or a short-circuit between tracks. 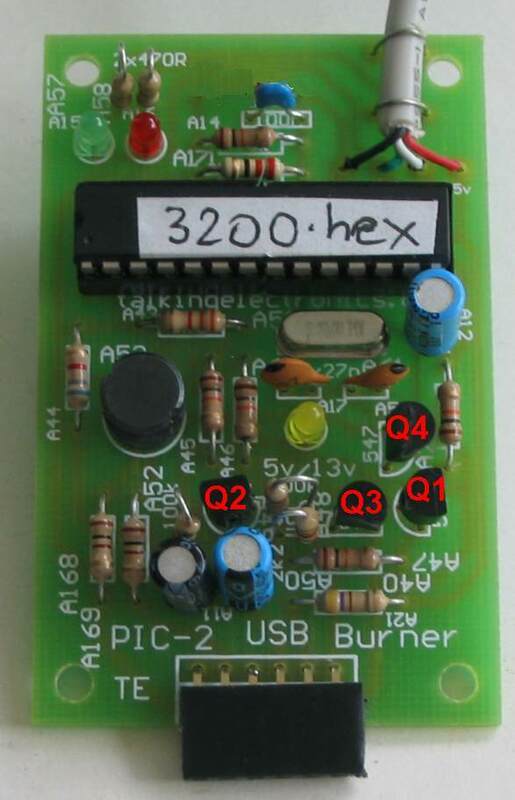 The program in the PIC18F2550 (PK2V023200.hex) must match the correct version of PIC 2 Programmer software (v2.60). 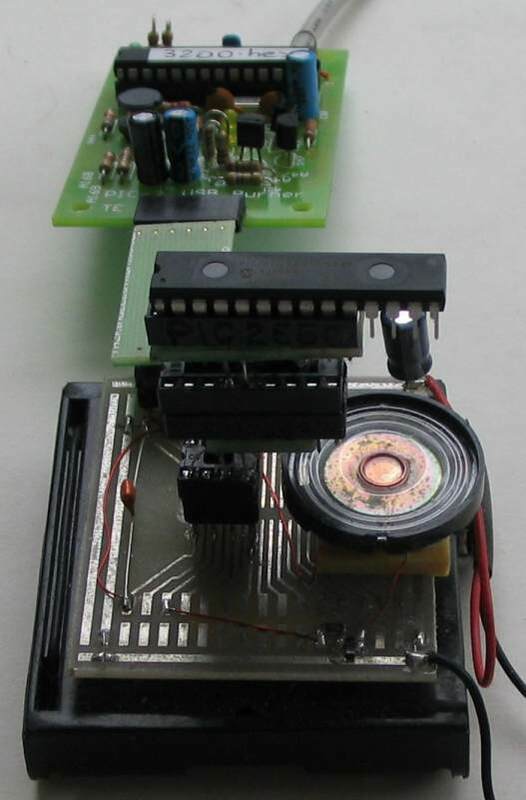 Note: The PIC-2 USB Burner leaves 5v on the chip after programming and the Burner should be removed so the chip (in the project you are burning) will reset and execute the program when the power to the project is turned ON. This only applies when you are burning a chip "ICSP." To test the PIC-2 USB Burner, connect the 6 pin to 5 pin connector, build the Burner Board with 8 pin socket and make sure all the wiring has been added to the board to connect the programming pins to the pins of the chip. Fit a chip that has already been programmed (from one of the kits) and install PICit-2 v2.60 software on your computer and provide a link to your desktop. Plug the programmer into one of the USB ports on your laptop and it will produce a message to show the programmer is recognised when it is plugged in the first time. (It may not be identified on some laptops - this does not matter). Click on PICkit 2 Programmer icon and the programming screen will appear. At the same time, the software will send a signal to the Burner to "open up" the chip and read its part number. Activity on the USB port can be observed via the Data+ and Data- LEDs flashing slightly and via the yellow LED flashing very brightly, indicating 13v Vpp is being produced by the "high voltage" circuit. If the Data+ and Data- LEDs do not illuminate, the PICkit 2 program on the laptop has not identified the correct USB port. This could be due to the PIC-2 USB Burner not sending a recognition signal to the laptop when first connected. Disconnect the Burner and re-connect to the computer. Watch the data+ and - LEDs. They will flash to indicate activity. If not, the PIC18F2550 chip on the Burner is not being accessed and sending the initial "handshaking" signal. Check the yellow LED as it will be dimly lit to indicate 5v. Remove the 6 pin to 5 pin connector and re-connect it to the Burner socket or the pins on the "Burner Board." The yellow LED will flash brightly to indicate it is trying to open up the chip on the "Burner Board." If this flash does not occur, the high voltage section is not working. Make sure the 1mH inductor has continuity as the winding you created may not be connected to one of the pins. Make sure the yellow LED is around the correct way and make sure it still works and has not been damaged during soldering. Place a LED with 470R on pin 2 to make sure the chip is sending a signal to the oscillator (buffer) transistor that produces the high voltage. 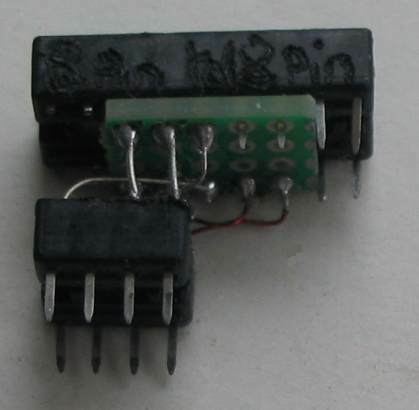 The burner will also burn 18 pin chips and 28 pin PIC18F2550 chips by using the following two adapters. These are easy to build using sockets and small pieces of matrix board with tinned copper wires between the sockets. The 8 pin fits the socket on the boar and this joins an 18 pin socket. The 18 pin socket joins a 20 pin socket and the 28 pin PIC18F2550 fits into this socket with pin 1 at the end and it overhangs the socket. Some of the pins in the socket have been removed and this makes it easy to insert and remove the chip. If you have problems burning a chip, here are some helpful notes. If you cannot download an .exe file, download the .zip and extract it into the folder to produce the .exe file. 2. Create a short-cut to the .exe file and place it on your desktop. 3. Connect the USB programmer to the USB port on your laptop and add the 6 pin to 5 pin connector board. 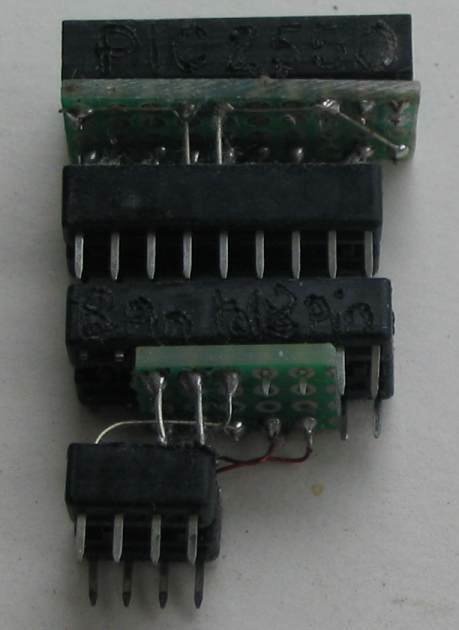 Make sure the board holding the chip does not have any components connected to the programming pins. 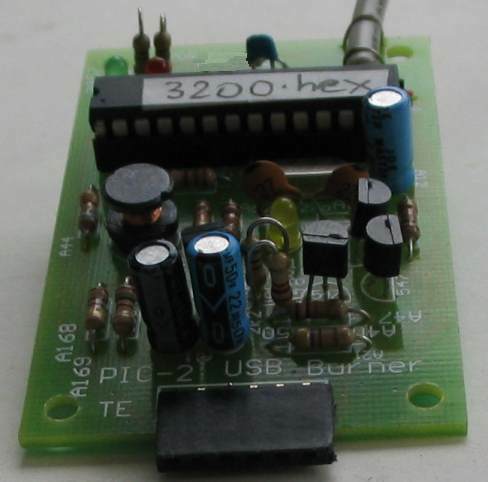 The programmer is very sensitive to any loads on any of the pins and will not detect the chip. 4. Click on the PICkit-2 desktop icon and the programming window will appear and detect the chip you will be programming. If it does not detect the chip, go to the folder and remove PICKit2.ini This file is produced at the end of each time you use the programmer and holds data that is not wanted. 5. If a window appear with Low Vpp, simply click on it to remove it and click to get the main programming window. 6. Go to Tools and click on "Force PICkit 2" so the 5 volt window appears on the screen. PICkit 2 can be used as a debugger. We are not introducing the debugger section as this involves additional software and an additional "learning curve." ICD2 and PICkit2 have almost the same capability. PICkit-2 is cheaper. PICkit 2 software is designed for MS Windows and a program called “pk2cmd.exe” is used for Linux based computers. All our discussion is based on Microsoft Windows computers. PK-2 Lite (PICkit2 Lite SE ) is PICkit-2 Student Edition and has fewer components than PICkit 2 from Microchip. It is exactly the same as PIC-2 USB Burner. The Student Edition uses through-hole components whereas the original design used surface-mount components. PIC-ICD2 is an In Circuit Debugger and Programmer. It is an old design and has many problems. PICit-2 supersedes this device. MPASM is the program that converts the program you write in TextPad to .hex for PIC-2 USB Burner to download into the PIC chip. ICSP - In Circuit Serial Programming. If a PIC chip is soldered to the PC board and three programming lines are available (as well as 5v and 0v), the chip can be re-programmed without removing it. There can be a problem with this. If a load is connected to any of the programming pins, the chip may not see full-amplitude signals and will fail to program. We suggest removing the chip and burning it on the Burner Board, then putting it into the project you are working-on. This project provides you with a programmer for the whole range of PIC chips, but we have concentrated on two of the smallest chips in the range, the PIC12F629 and PIC16F628 - to keep things simple. No matter if the project is large or small, it has to be designed and the best board to use is a PROTOTYPE BOARD such as the one shown in photo above. All the components and wiring can be seen at the same time. This save turning the board over and making mistakes. This Matrix Board has been designed by Talking Electronics and contains circular lands for each hole so the parts can be placed in any hole and do not have to correspond to grids or conductors under the board. The lands under the board can be connected with fine tinned copper wire and they will eventually become the tracks of the PC board. The most absurd design ever invented is STRIP BOARD. It consists of conductors running the length of the board and you have to either cut the conductor or place your components to correspond with the conductors. When a cut is made, the hole cannot be used!